If that doesn’t get your attention, I don’t know what will! Now that I’m in my fifties, I have started to notice how my neck looks and I have realized that I need to do some damage control. The skin on your neck and décolletage is delicate, and if you’ve exposed them to sun (which I have), if you’ve smoked, and, if you haven’t cleansed, exfoliated and moisturized it the way you have your face…chances are it’s crepey and wrinkled. As we get older, our bodies produce less collagen and the skin becomes less firm and thinner. Its ability to retain water lessens, and all of this causes the formation of wrinkles. Women also produce less estrogen, which has an impact on cellular activity. Wrinkles happen because the skin is less elastic and they don’t just on the face, but also on the neck. For some reason, we often neglect our necks! The skin on your neck and chest is every bit as delicate as the skin on your face, and the best way to delay the aging process is to boost its elasticity. Because the neck skin is very thin and has fewer sebaceous glands, and fewer cells that produce the pigment that gives color to the skin and protect it from sunlight, it is extremely susceptible to environmental damage. If you have been neglecting your neck and chest, now is the time to remedy that situation! Cleanse your neck and décolletage both morning and night and apply NeoStrata Triple Firming Neck Cream, using an upward, circular motion from under your chin to the top of your cleavage. Be sure to use a product that is specifically formulated for the neck. Massage it in, to help it penetrate the skin and to boost the circulation in that area. A recent study revealed that “older skin that hadn’t been exposed to the sun had about 3,800 genetic mutations whereas skin that had been exposed had around 10,000 mutations in the same genes, meaning the aging process had happened more quickly”. Many of us include some form of SPF protection in our skincare, and most foundation contains sunscreen, but most of us are not protecting our necks and chests. Apply sunscreen to your neck and décolletage every day. Use a broad-spectrum sunscreen, and re-apply it if you are outside for long periods of time, even when it is overcast or cloudy. It’s important to stay hydrated from within, by drinking water throughout the day and getting hydration from fruits and vegetables. Eat foods that are high in anti-oxidants, especially Omega-3 acids, which are present in fish. These do wonders for skin rejuvenation by boosting collagen production. Eat several portions of salmon or mackerel a week, and take a daily fish oil supplement. Find an amazing salmon recipe here and here. Pomegranates, acai berries, blueberries and green tea also help you stock up on antioxidants. Consider the size of pillow you sleep on. Using a high pillow can result in neck wrinkles if used over a long period of time, but a small pillow maximizes the angle between the face and neck, and slows down the skin’s aging process. A few well placed injections of Botox can temporarily tighten a crepey neck, making it look and feel tighter. Also, injecting fillers along the jawline, and in front and below the ear, can lift the skin making it feel tighter. Wether you decide to consider Botox or fillers, using NeoStrata Triple Firming Neck Cream is important for taking care of your delicate skin. It’s never too late, to start taking care of the skin on your neck, but, the sooner you start the better! This post was sponsored by NeoStrata, but all opinions are my own. 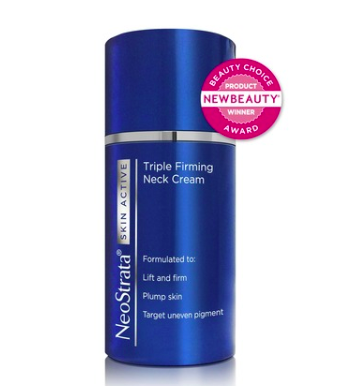 I’ve been using NeoStrata Firming Neck Cream for about 3 weeks now and I do really love the product. You’ll find this product in high end medical spas and online. Mar 10 Why Is Collagen All the Rage These Days?